'Butterfly Baby' (Mary Herd, R. 1966). Seedling #BFW 59-52. BB, height 27" (69 cm), Early midseason bloom. 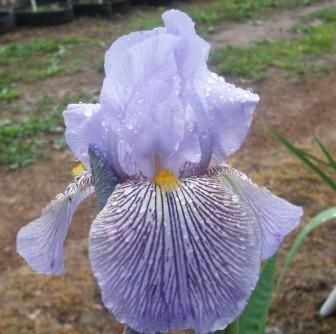 Pale violet-blue self; Falls lined with pinstripes of deep violet nearly to edges. 'Butterfly Wings' X 'Castle Rock'. Fleur de Lis and Herd 1967.